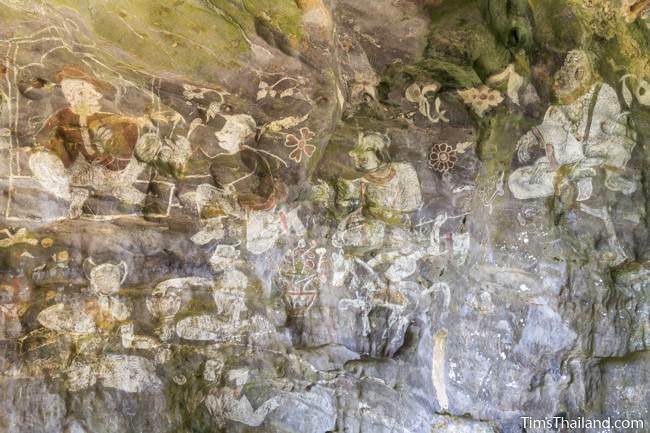 A very unusual rock art site, Tham Sam cave (ถ้ำซำ) has a long wall covered with large paintings of people. 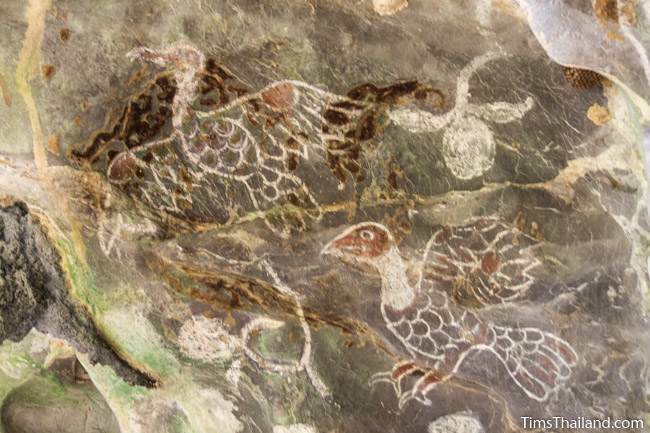 These have no connection or resemblance to the many ancient cave paintings found around the region except that both are made with natural pigments – probably derived from tree sap. These consist entirely of red, white, and black and the lively results from the limited palate are a testament to the great skill of the artist or artists. 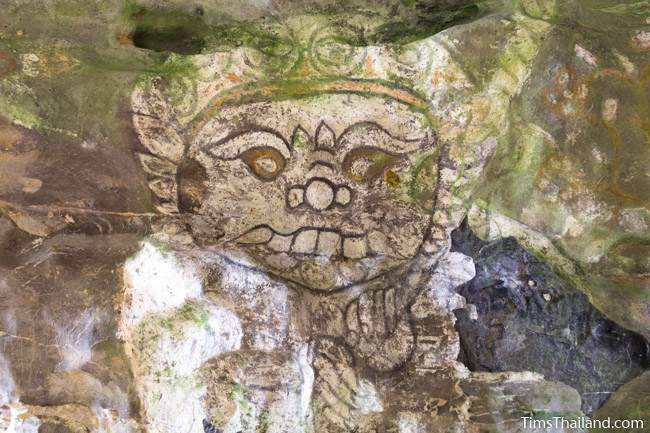 The style is clearly southern – the faces look like nang thalung shadow puppets – and the Fine Arts Department dates them from either the King Rama IV or King Rama V reigns (1851 to 1910). 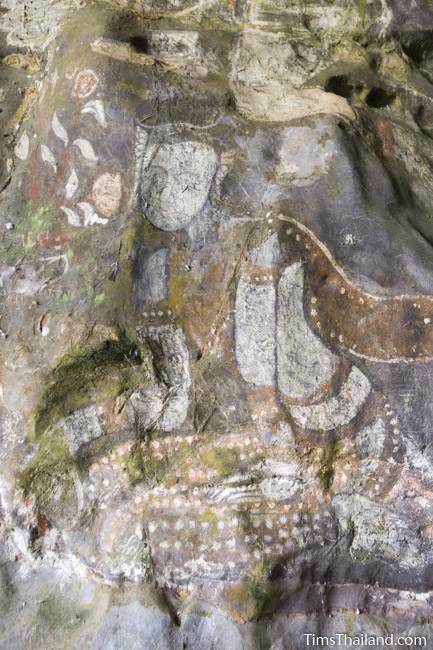 Beyond this, little else is known about the Tham Sam paintings. 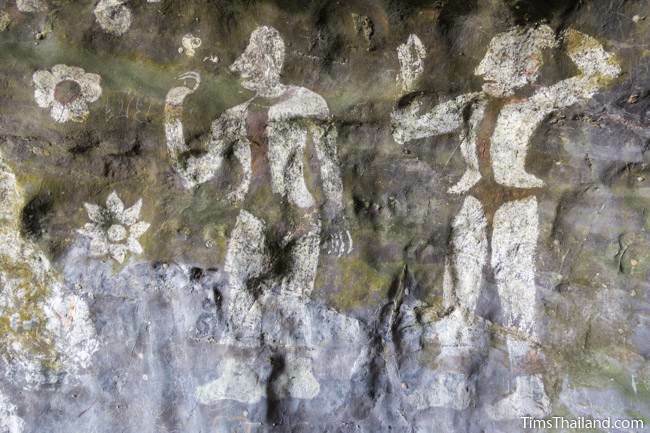 Even though there's a Buddha relief carved into a rock (which may or may not date from the same era) and at least two of the figures in the mural are monks (they are holding "fans"), the paintings probably weren't made for religious reasons. Rather, most appear to just be scenes of daily life. One person has proposed that they were scenes of someone's life, making this an abridged biography – what appears to be a casket lends some credence to the idea. 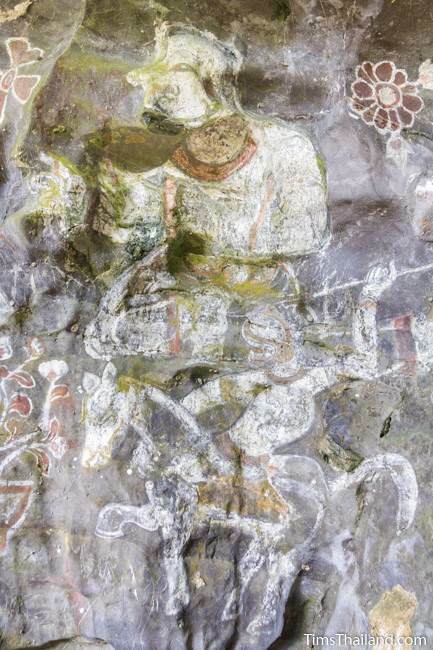 Some of the figures appear to be Chinese. 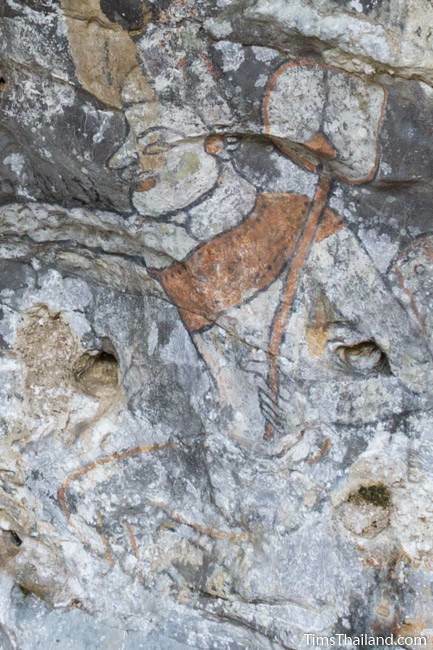 Also, there's a man riding a horse about to throw a spear and some sort of deity or creature with a face that could be a yak, the giants that are commonly used as temple guardians in Central Thailand. They are all surrounded by birds and flowers. 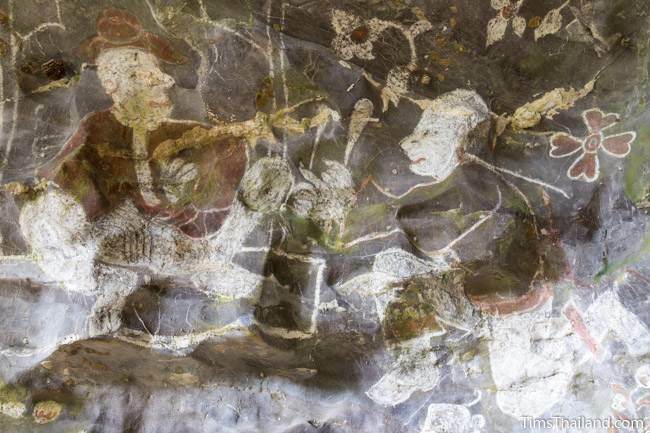 While overall the mural is in decent condition, there's enough damage and fading that it's hard to tell what most of them are doing. 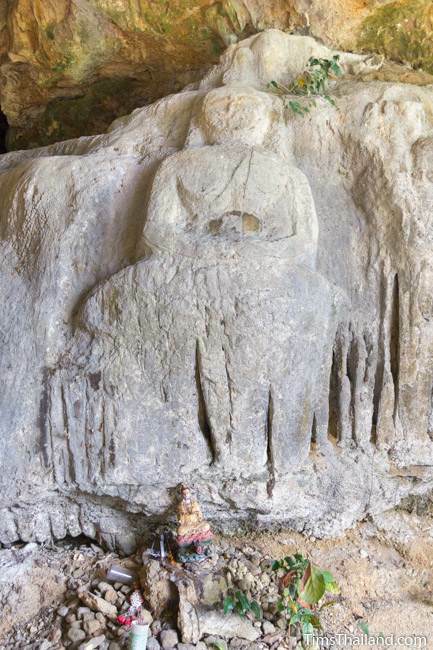 One woman, for example, is kneeling on the ground and grasping something in front of her, but this object can no longer seen. 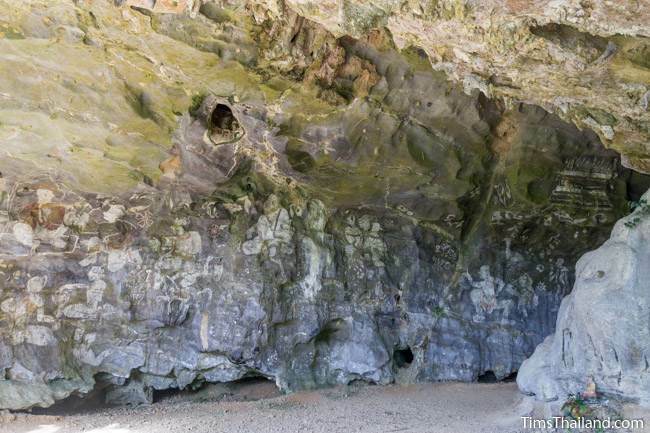 The paintings are all at the front of Tham Sam cave, a wide open space that's essentially a large overhang. 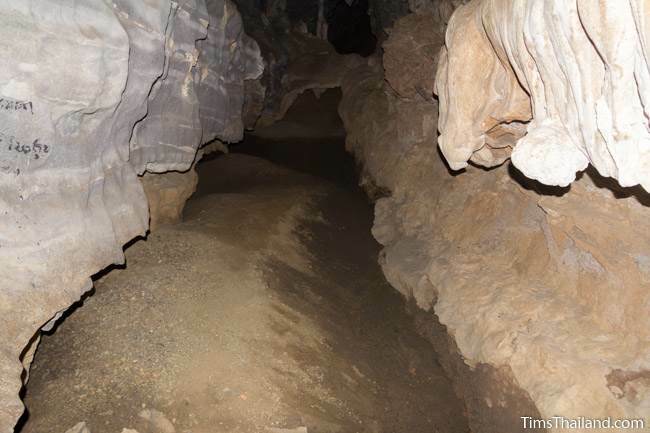 From this, a long, but not very large shaft cut by flowing water leads back into the limestone outcrop. 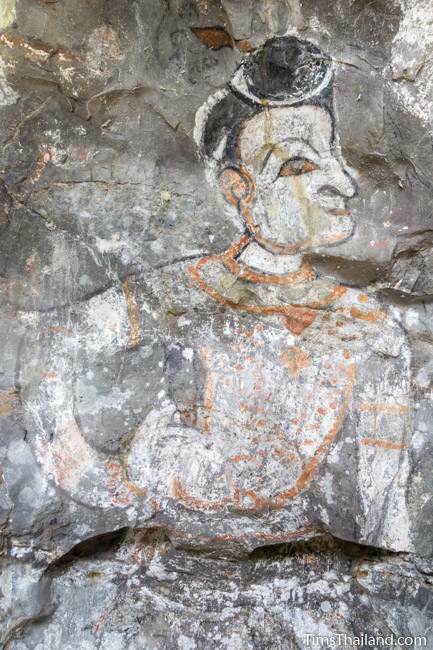 Most travelers to this region are eager to reach the beach so few stop in Phang Nga city, but anyone who loves temple paintings will also appreciate this site. 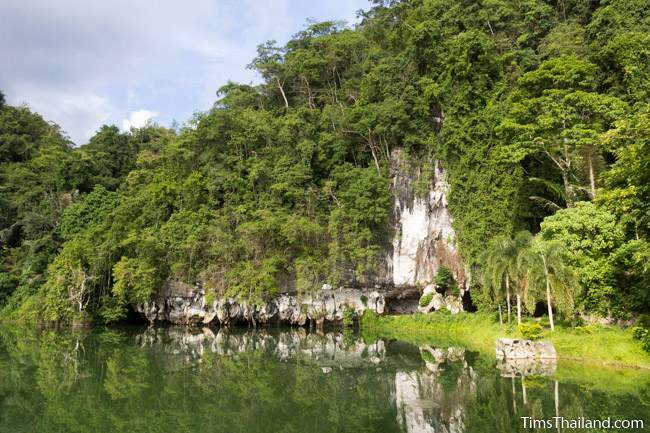 Tham Sam, and the beautiful little park around it, lies just across the Phang Nga River from town, a fifteen-minute walk from the guesthouse area. It's easy to find as there's a little lake and a big green sign in front.